In 1887, Joel Asaph Allen posited a biological rule that warm-blooded animals in colder climates tend to have shorter limbs than the equivalent animals from hotter climates. Christian Bergmann, posited a similar rule in 1847. Bergmann’s rule is that the body mass of warm-blooded animals increases in colder climates. The mechanism behind these phenomena is thought to be temperature regulation. Warm-blooded animals have to maintain a narrow core body temperature range or they die. Surface area to volume ratio is a critical factor in heat transfer. A low surface area to volume ratio tends to retain heat while a high one tends to radiate heat into the environment. This effect is the reason that car radiators and the heat exchanger in an airconditioner have huge surface area. Shape controls the ratio of surface area to volume. A sphere is the shape with the minimum surface area for volume while a flattened pancake has close to the maximum surface area for volume. This is oranges burst when you squeeze them. As the orange flattens, its volume stays constant but the skin must stretch. Eventually you exceed the elasticity of the skin and the orange bursts. Another example is a stack of 8 sugar cubes (1cm x 1cm x 1 cm). If you stack the cubes 2 x 2 x 2, then the volume is 8 cubic cm and the total surface area is 16 square cm. If you stack the cubes in a 1 x 2 x 4, then the volume is still 8 cubic cm but the total surface area is 22 square cm. Azawakh are medium-sized hounds in the range of 40-50 pounds. That makes them the same mass as a Norwegian Elkhound but about 7 inches taller. That’s Allen’s rule in play. 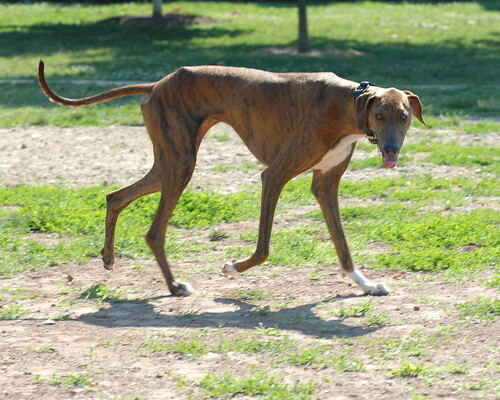 An English Greyhound is of roughly similar height to an Azawakh but weighs 20-30% more. This is Bergmann’s rule in play. To use a car metaphor, the Elkhound has the same size engine but a much smaller cooling system and the Greyhound has the same cooling system but a much larger engine. The flat, dry musculature, long legs and high tuck of the Azawakh are all adaptations for heat tolerance. Previously, I wrote about the color rules in the FCI standard for the Azawakh breed. The FCI or Fédération Cynologique Internationale is the governing body for purebred dog standards throughout Europe and most countries. At a high level, the way this works is the main body sets standards and policies in Belgium and then member kennel clubs in each country administer a registry. The big exception is the USA and England which have their own kennel clubs which set their own breed standards. I don’t know this definitively, but I’m guessing that since the Kennel Club (KC) and American Kennel Club (AKC) were founded in the 1890s by a number of uptight pretentious men they had very little interest in taking orders from a wholly separate set of uptight European pretentious men who only got around to organizing themselves in the 20th century. The point I’m getting at here is that the AKC and KC can have totally different rules and standards for a breed than the FCI. In fact, they don’t even have to recognize the same breeds as the FCI. The FCI recognizes Azawakh as an official breed with a rigid standard. The AKC recognizes Azawakh as a rare (foundation stock) breed which cannot even be shown in regular dog shows. The status as a foundation stock breed means that things like the registry and conformation standard for the Azawakh are in flux with the AKC and considered fungible. Some things have already been changed relative to the FCI standard: colors, for example. The standard proposed by the American Azawakh Association for use by the AKC is the same as the FCI standard except where colors are concerned. Color: Fawn with flecking limited to the extremities. All shades are admitted from clear sand to dark red. The head may or may not have a black mask and the list is very inconsistent. The coat includes a white bib and a white brush at the tip of the tail. Each of the four limbs must have compulsorily a white “stocking”, at least in the shape of tracing on the foot. Black brindles are allowed. Light eyes; ie. bird of prey eyes. Color: Fawn, clear sand to dark fawn, brindle, white, black, grey, blue, grizzle, parti-color, and all shades of brown to include chocolate. The head may or may not have a black mask. There may be white markings on the legs, bib and at the tip of tail. The standard proposed for the AKC is much better that the FCI one. Since it now includes everything but the kitchen sink, is it even meaningful or is it just a complicated tangle of words that nobody can possibly remember? Also, there are combinations of acceptable colors that would guarantee the eliminating fault of “light eyes”, such as homozygous blue dilution with homozygous liver (dd + bb). The light eye prohibition seems to be baseless. Field studies conducted by ABIS have found that there Kel Tamasheq do not systematically select for particular colors. It seems to me that we should adopt the same lack of criteria. After all, the dogs are much more theirs than ours. Color is a distraction that shouldn’t be driving the selection of Azawakh. I propose a straightforward and easy to remembe simplification that would make color a non-issue. Color: Any color combination is acceptable. Last time, I took a spin through coat color genetics in dogs and tool a look at some of the things in the Azawakh standard that don’t fit. I left out some finer points of discussion involving genes that convert black pigments to brown and/or blue. Let’s start things off with some quotations from the FCI Azawakh standard and then we’ll take a look at whether they make any sense. Nose: Nostrils are well opened. The nose is either black or brown. Eyes: Almond shaped, quite large. Their color is dark or amber. Eyelids are pigmented. Coat: … Black brindles are allowed. Although these are color rules in the FCI Azawakh standard are outside of the discussion of the coat, the loci that control these traits also affects coat color. The default color for noses in dogs is black. Brown noses are controlled by the the B or Liver locus. The recessive allele of this locus affects the production of eumalanin, converting all black in the coat to brown (aka liver). Saddles, shading, brindling and nose pigmentation are all converted from black to brown. Recessive B (bb) also causes amber eyes. When liver is expressed, anywhere there is black in the body of the dog it is converted to brown. It is impossible for a bb dog to have black anywhere in its coat. Recall that brindle is controlled by the K or black locus. The dominant black K gene does not occur in Azawakh but the semi-dominant k(br) allele does occur as well as the k, non-black, allele. Any dog that has a k(br) gene will be black brindled, but if it also has recessive bb, then the bridling will be dark brown. The amendment that added brindling contains a mistake. At the very least, it must be changed to allow black or brown brindling. ABIS has surveyed a few blue Azawakh in the Sahel and there have rarely been blue Azawakh born in the West. This can be expressed as either blue brindling or blue mask or both. Blue is controlled by the D locus. The recessive d allele primarily affects the production of eumalanin pigment, causing it to shift from black to blue. It also has a slight effect on red phaeomelanin pigment causing it to be less red. The D locus can interact with the B locus. If a dog is both recessive liver (bb) and recessive blue (bb), then it will have Isablella black. Weimeraner’s are isabella colored. Blue also affects nose pigmentation. In a blue dog, the nose cannot be black, it will be blue. In an Isabella dog, the nose is isabella which looks like brown with some blue tattooing. Amber But Not Light Eyes? I cannot understand what the difference is between amber and light eyes. Very light eyes occur in isabella dogs which must be both recessive for B and recessive for D, an excruciatingly rare combination in Azawakh. Most likely amber is caused by the expression of recessive B (liver). In a liver dog, there is no genetic difference between a dark amber and a lighter amber. These are just chance differences in development of pigment producing cells. Both are caused by the bb combination, which is allowed. Also, how light is light? When does amber become “bird of prey”? How many angels can dance on the head of a pin? The light eye eliminating fault prohibition should be stricken. Last time, I made a whack at rewriting the coat color rules. I mostly left out the discussion of dilution and brown loci. I need to update my rewrite to account for those loci. Nose: Nostrils are well opened. The nose is black, brown, blue or isabella (blue + brown). Eyes: Almond shaped, quite large. Eye color is any shade of brown or amber. Eyelids are pigmented. Color: The base coat colors are forms of sable ranging from ivory to red and may be grizzled. Brindle markings may be present. Mask may be present. Mantle or saddle may be present. White on the extremities, with or without ticking, may be present including Irish marked and particolor patterns. Black markings may occur in the liver brown form, the dilute blue form or the combination blue + brown (isabella) form. There are a number of known genetic loci (places) that control coat color in dogs. What we know about the genetics of coat coloration cannot be reconciled with the FCI color standard. Azawakh have a base color of sable, also called red by many people. There are two main loci that control blackness or the lack thereof. The dominant black gene is at the K locus, which also controls brindling. k(br) – k(br) is the brindle gene. k(br) is recessive to K but dominant over k.
Black dogs are almost unknown in the Sahel. Selection works very well at removing dominant traits and we know there is a strong cultural bias against black animals because animist tradition teaches they are evil. Also the desert climate may exert strong selection pressure against K. The dominant black gene almost certainly does not exist in the Azawakh population. Because K is not present, the base coat color of Azawakh is controlled by the Agouti locus. Agouti is largely about controlling the production and timing of black eumelanin pigment in the coat. When coat does not produce much eumalanin it allows us to see the inherent red, phaemlelanin, in the coat. There are five Agouti alleles. In the Agouti series, the dominant allele is A(y) which is the basic red Azawakh. However, I believe that all 5 alleles exist in the general population. The a(t) and a alleles are rare because puppies that are black or mostly black would be culled, but because they are recessive it is difficult to remove them from the population entirely. The C locus is not very well understood. It is clear that the intensity of redness is controlled in recessive red dogs, like Azawakh, is controlled by the C locus. The C locus is thought to be a location of co-dominance, meaning that the recessive genes partially express when present. Different combinations of alleles from the C locus allow a range of redness from redk like an Irish Setter, to ivory, like a Samoyed. Clear sand is not specific, but it sounds like a very light yellow perhaps from a combination like c(e)c(P) or c(ch)c(P). If c(P) exists in order to create the “clear sand” color combination then c(P)c(P) is also possible, if rare. That dog would be pure white. How can one recessive combination of genes be allowed but another one is forbidden? With the exception of whiteness due to red dilution at the C locus, white develops from the extremities. The locus that controls the “height” of whiteness is S, spotting. The dominant allele is S which is no white. Like the C locus, S is an example of incomplete or co-dominance. s(t) – Trim. Very small amounts of white on the tips of the toes and tail tip. There is a huge problem with the standard in that it calls for an unstable color pattern. It requires either a heterozygous dog that carries one irish pattern gene or just random luck during development. The most dominant allele is S, which is no white. However, dogs that are homozygous S (SS) can still often express a phenotype with a white bib and a trace of white on their toes and the tip of their tails. This white expression has no genetic basis! It is just a residual white pattern caused by pigment cells not spreading fully to the extremities during fetal development. The classic white socks and bib pattern is probably requires heterozygosity in the form of s(t)s(i) or perhaps Ss(p) because if you have s(i)s(i) then you’ll have a classic Irish marked dog with a white collar which is now forbidden in France. Think about this for a minute. Let’s say we have two dogs with just the right white socks and no collar marking. They are both Ss(i). First of all, it’s just luck that they don’t have a significant white spot on the neck but more importantly, their color pattern isn’t stable when crossed. 1/4 of the puppies will be s(i)s(i), one quarter will be SS and half will be Ss(i). Because of the residual white effect, some of the SS puppies may well be within the standard. Dogs that are s(i)s(i) may also fall within the norms and not have a white spot on the neck just by luck. A standard that asks for white on the extremities but tries to avoid an Irish marked pattern is indefensible genetically. Also, eliminating the non-white SS dogs from the breeding population will tend to select for homozygous recessive Irish marked, s(i)s(i). That’s exactly the pattern we see playing out. The dogs in Europe are becoming more consistently Irish marked. The dominant ticking gene, T , is also clearly present. The ticking gene is dominant over non-ticking. Ticking or roaning is small spots of the base color on white areas. Ticking usually expresses on legs, muzzle and chest. I have heard that in Europe some consider this “dirty markings” and select against it, but why? The oldest examples of Azawakh and many champion Azawakh had ticking in their white. Most Azawakh have small red “freckles” in their chests and socks. There are also dilution genes which can yield blue brindle and have some other effects, but since this is already too long I’ll save that for another post. Color: The base coat colors are forms of sable ranging from ivory to red and may be grizzled. Brindle markings may be present. Mask may be present. Mantle or saddle may be present. White on the extremities, with or without ticking, may be present including Irish marked and particolor patterns. Black markings may occur in the dilute blue form.